School of Sport & Exercise Science 2016 Update Video! The School’s inaugural video update is now available, with news on changes to our programmes, assessment procedures, student and School achievements etc! Thanks to Dan Bishop for creating the video, and please let us know what you think of it! This entry was posted in Publications, Staff, Students and tagged Developments, Flipagram, news, Update, Video on October 24, 2016 by Sandy Willmott. New research from the School of Sport & Exercise Science’s Mental Toughness Research Group has shed light on elite golfers’ experiences when competing. Christian Swann and Lee Crust led a team that used a novel, inductive approach to analyse the data from interviews with ten European Tour golfers. Contrary to previously-reported experiences in other sports, the golfers indicated that they could tell when they were “in flow” and were able to control this state. The results also suggested refinements to the existing theoretical model in this area. With the considerable current interest in golf, arising from the Ryder Cup, the research from Lincoln has been featured by both Science Daily and the Daily Telegraph. The full article An inductive exploration into the flow experiences of European Tour golfers is published in the journal Qualitative Research in Sport, Exercise and Health. This entry was posted in Publications, Research, Staff and tagged flow, golf on September 29, 2014 by Sandy Willmott. The latest issue of Sports Focus – the School’s newsletter – is now available. This is a special Graduation edition, in which seven of our 2013 graduates talk about their time in Lincoln and how they were able to enhance their applied skills and knowledge. The students have successfully embarked on a diverse range of career paths involving postgraduate study and/or sport, exercise and health-related employment. This entry was posted in Publications, Students and tagged graduation, news, Sports Focus, volunteering on November 7, 2013 by Sandy Willmott. 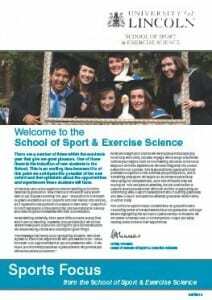 Now Out: School of Sport & Exercise Science Magazine! The new School of Sport & Exercise Science Magazine is now available. It is our opportunity to share with you some of the remarkable work that takes place in our department, from ground-breaking research, to community projects, to the incredible successes of our students. We hope you enjoy it! This entry was posted in Publications and tagged magazine, news on November 3, 2013 by Sandy Willmott.